A University of Iowa student was found dead Wednesday in an incident that may be weather-related. Gerald Belz was found unresponsive behind a campus building at around 2:48 a.m. local time (3:48 a.m. ET), according to a statement from the University of Iowa. He was taken to a hospital, where he later died. Belz was a second-year, pre-medicine major from Cedar Rapids, Iowa. As many as eight other people in multiple states are believed to have died due to the weather. Two people are in critical condition in a 27-vehicle pileup on Wednesday in Wyomissing, Pennsylvania, police say. A total of 24 people were injured in the massive crash, according to Wyomissing police. Police say 15 of the victims were treated at the scene by emergency medical services and the other nine were hospitalized. Two are being treated for critical injures. Berks County Dispatch said the crash was weather-related but that an investigation will be needed to determine the exact cause. A 26-vehicle crash involving trucks and cars during a whiteout from a snow squall snarled traffic on a busy eastern Pennsylvania highway Wednesday afternoon. No, this isn’t a scene from the 2004 film, “The Day After Tomorrow.” This video was taken in Chicago in 2019. Instagram user Brent Buck recorded the icy landscape and frozen shores of the city as he flew into Chicago on Wednesday morning. The video captured steam fog rising up over the waters of Lake Michigan as a polar vortex plunged the area into subzero temperatures. “What negative a billion degrees looks like from the air,” Buck captioned the video. Chicago’s temperature dipped to minus 23 degrees Wednesday morning with wind chill below minus 40 degrees. The weather only slightly improved in the afternoon, rising up to minus 15 degrees by 2 p.m. ET. A zebra froze to death in Indiana on Wednesday after it couldn’t find shelter in subzero temperatures caused by a polar vortex hitting the country. Carroll County Sheriff’s Office confirmed that the animal got caught in the fence of the property where it was being kept and it was unable to get loose, NBC-affiliate station WTHR Channel 13. The animals owners also have another zebra, a pony and a kangaroo on their property, the sheriff’s office said. 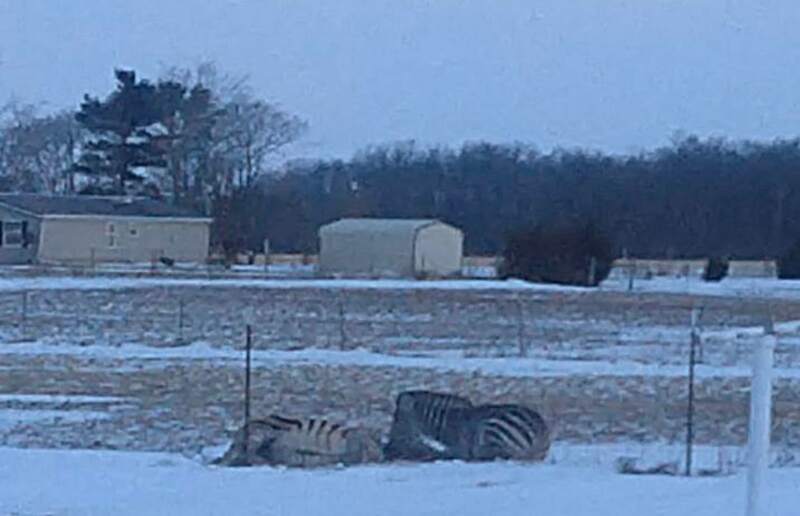 A zebra that froze to death after it was unable to reach shelter in the subzero temperatures in Carroll County, Indiana, on Jan. 30, 2019. Several people were injured after a snow squall sparked at least 26 vehicles to crash in Pennsylvania. The accident occurred on U.S. Route 222 in Wyomissing at about 1:25 p.m. ET and blocked all southbound lanes on the busy highway. Vehicles involved include at least two big rigs, a dump truck and a large box truck. Berks County Dispatch confirmed that the accident was weather-related but will have to investigate the exact cause. At least 17 ambulances were sent to the scene, dispatch said. A Level 2 Mass Casualty Incident was declared meaning up to 25 people could be hurt, NBC Philadelphia reported. 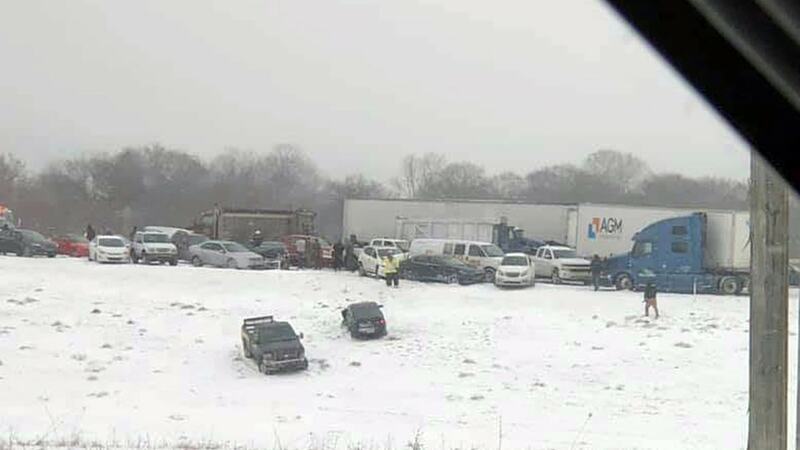 A 21-car pileup on Interstate 90 in western New York forced traffic in both directions to be diverted on Wednesday afternoon, authorities said. The multi-vehicle crash happened at about 2 p.m. near the town of Batavia — about 45 miles east of Buffalo and 35 miles west of Rochester, NBC affiliates WHEC and WGRZ both reported. A New York state trooper suffered non-life threatening injuries in the massive collision. It wasn’t immediately clear what, if any role, the weather played. There’s a blizzard warning in the area and afternoon temperatures hovered around zero. At least eight people in multiple states are believed to have died due to the weather. Officials in Illinois said one person in Tazewell County died Tuesday because of extreme wind chill in the area. Two other deaths were reported in Pekin and Libertyville, both in Illinois. The other deaths occurred in Indiana, Nebraska, Iowa and Wisconsin. Two counties in upstate New York have ordered drivers to stay off the roads due to drifting and blowing snow causing unsafe conditions. The Genesee County Sheriff’s Office said Wednesday around 2:45 p.m. ET that a travel ban has been put in place, effectively immediately. The ban means all drivers, except emergency personnel, are to stay off roads. The order will remain in effect “until further notice,” the sheriff’s department said in a press release. “For your safety, and the safety of the residents of Genesee County, please stay home or where you are until conditions improve,” sheriff William Sheron said. A travel ban was also issued in Erie County on Wednesday afternoon for multiple towns. The Erie County Sheriff’s Office said in a tweet that traveling is prohibited and “all cars must leave roads.” To see if your town is effected by the travel ban click here. The low temperature was minus 15 degrees in Hell, an unincorporated community in Livingston County, Michigan. The high temperature was minus 4, prompting some on social media to note that Hell had literally frozen over. The United States Postal Service suspended service throughout Chicago on Wednesday to protect employees from the harsh conditions. Some pet owners believe animals can stand colder temperatures than humans, which is not always true, and depends on the animal’s breed, size, health and age. Here are some tips from the American Veterinary Medical Association to keep your pet safe during the cold spell. Cats and dogs are susceptible to frostbite and hypothermia, just like humans, and shouldn’t be kept outside when the temperature drops below zero. Pets’ paws should be checked for cold-weather injury like cracking and bleeding. Paws, along with legs and bellies should also be wiped after pets are outside for any period of time as they can pick up traces of antifreeze or other de-icing chemicals, all of which can be toxic to animals. The American Society for the Prevention of Cruelty to Animals also recommends rubbing petroleum jelly on paws and clipping belly fur to prevent pets from picking up such chemicals. Pets are more prone to go missing in the winter because snow and ice mask the scents that would usually make it easier for an animal to find its way home. Pets should always, but especially in the winter, have tags or a microchip. Staying warm burns extra calories, so the ASPCA recommends feeding your pet a little more food and giving it more water when the temperatures are very low. But the American Veterinary Medical Association says a higher weight can lead to health risks, so there’s no need to overfeed your pet all winter. Cats love hiding near warm car engines during cold weather, but the habit can be deadly. The American Veterinary Medical Association recommends drivers honk their horns or make other noise to encourage any refuge-seekers to scurry away before the car engine is started. Here’s how cold and miserable it was around the Midwest and parts of the East a little after 1 p.m. CT (2 p.m. ET) on Wednesday. Record-breaking cold in Wisconsin, Michigan and the Great Lakes will yield at least one good result — death to thousands of the invasive Emerald Ash Borer beetle. For decades now, the beetle has made an all-too-comfortable home in America’s heartland, feasting on and killing Ash trees by the thousands. The insect was first imported in wood packing material from China that docked in Los Angeles and was transported by rail to Detroit in the 1980s, scientists have said. More than 60 percent of the Emerald Ash Borer could be wiped out by this week’s cold snap, according to Andrea Diss-Torrance, invasive forest insects program coordinator for Wisconsin’s Department of Natural Resources. The Emerald Ash Borer will repopulate, but landowners now have a two-year window to remove beetle-damaged trees before they fall or apply anti-beetle treatment to those trees before the insects rebound, according to Diss-Torrance. “It’ll knock them back, but it’s not going to cause them to be cleared out by any means,” she told NBC News. Indiana authorities are investigating whether the deaths of two people found outside their homes may be related to the weather. The body of a 59-year-old man was found in the driveway of his Muncie home on Tuesday morning, according to the Muncie Star Press. An 87-year-old woman was found dead in the driveway of her home in the town of Albany on Saturday. Police have not released their names. The deaths occurred before Indiana was thrust into the worst of a deep freeze that hit the Midwest on Wednesday, but Delaware County Coroner Rick Howell said they are being investigated as possibly weather-related. Howell said autopsy reports for both people are pending toxicology tests, and foul play was not suspected in their death. In Pekin, Illinois, an 82-year-old man died Tuesday afternoon after he was found suffering from hypothermia outside his home, NBC affiliate WEEK of Peoria reports. A man in Libertyville, Illinois, was killed Monday when he was hit by a snowplow at the end of his driveway. NBC Chicago reports that the driver of the snowplow has been placed on paid administrative leave pending an investigation. In Milwaukee County, Wisconsin, a man was found frozen in a detached garage near his home. The county’s medical examiner’s office said the man may have been shoveling snow when he died. A 31-year-old man near Des Moines, Iowa, was killed in a car crash Monday on an icy interstate when state patrol said he lost control of his vehicle, struck a light pole and was ejected. In Nebraska, a 9-year-old boy died Sunday when the vehicle he was in lost traction on an icy road in Cass County and rolled into a ditch. Iowa State Patrol said five other people were injured in the crash. Chicago dipped to -23° this morning with wind chills below -40°. Many cities in the Midwest set daily record lows this morning, including Indianapolis that tied -11° and Toledo that set a new daily record of -7°. The cold continues Wednesday and into Thursday as arctic air spreads to the Northeast. While the cold won’t be as extreme in the Northeast as it was this morning in the Midwest, temperatures will drop to the single digits and wind chills will be below 0°. More daily record lows could be tied or broken Thursday morning including -7° in Detroit, -15° in Milwaukee, and -5° in Cleveland. A slow warm-up starts during the day on Thursday and continues into the weekend. Buffalo is under a blizzard warning through midnight for wind gusts up to 40 mph and dangerously low visibility for hours. A blizzard warning is also issued east of Lake Ontario including Watertown. Persistent, heavy bands of lake effect snow could produce 3-4 feet of snow around the Tughill Plateau and more than a foot total near Buffalo. Heavy snow lasts into tomorrow and weakens for Friday. Travel will be dangerous or impossible in these heavy bands of snow, in addition to frigid wind chills. At noon Wednesday, it was 16 below zero in Chicago — and as 96-year-old Zofia Biernadski looked out the window at the frozen city, she was instantly reminded of the winter of 1940. Earlier that year, the then 17-year-old Biernadski and thousands of other Poles had been rousted from their homes by the Soviets and deported by boxcar to what’s now Kazakhstan. So Biernadski has great sympathy for anybody venturing into the Chicago cold. “It’s like Siberia out there,” she said. 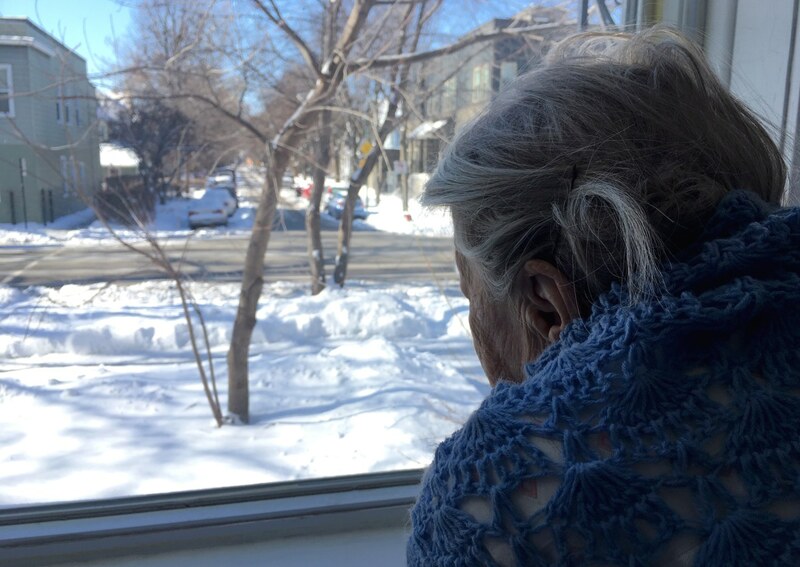 Zofia Biernadski, 96, at her home in Chicago on Jan. 30, 2019.